You message has been sent to the AIIB. At Market Forces, we achieve a lot with a little. Our campaigns have shifted hundreds of millions of dollars away from institutions that fund environmentally destructive projects. To continue this work, we need a community of donors who will give a little each month to enable our work. We’d like you to be part of that community, and part of Market Forces. Want to make even more impact? 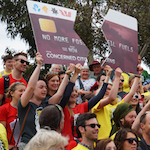 Complete the form below to send a message to the Australian Treasurer, calling for an end to all government handouts to the dirty fossil fuel industry. Tell Treasurer Morrison: End polluter handouts!